White tiled rectangular humidor that sits directly on floor. Silver riveted surface with latch and two doors. 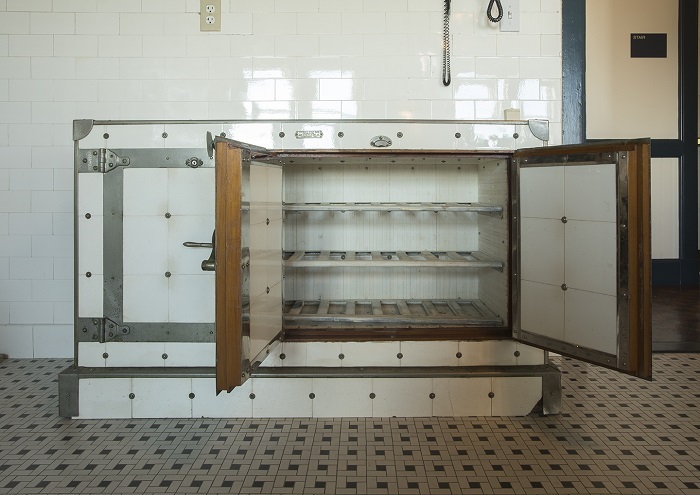 The Wilke Manufacturing Company also made refrigerators around the turn of the twentieth century that were covered in porcelain tiles, just as on this freestanding cigar case, which was likely owned by James Buchanan Duke well before Doris Duke was born. The design was awarded a patent in 1902, but some version of the case had been in production for several years prior to that. In the patent application, a smaller case with a single door is shown, but not surprisingly, James B. Duke owned the deluxe two-door model.